The Cumbrian uses some of the finest and most challenging cycling country in the UK, if not the world! The events headquarters are based at Dallam School on North Lancashire / Cumbrian border and the route uses some of the legendary climbs of the English Lake District, with approximately 6300 feet of climbing and 91 miles (full course) in distance through superb mountain scenery and is a classic sportive route appealing to expert sportive riders who relish a magnificent challenge. Climbs of Kirkstone Pass, Red Bank, Blea Tarn, the legendary “hard” side of Wyrnose Pass, Hardknott Pass, Birker Fell, Oxen Park and Bigland Hill all feature with an unforgettable descent of "The Struggle". Fully stocked feed stations are provided at Grasmere Youth Hostel on Red Bank and after the major climbs at Lowick Community Hall to refuel you for the return to the HQ. 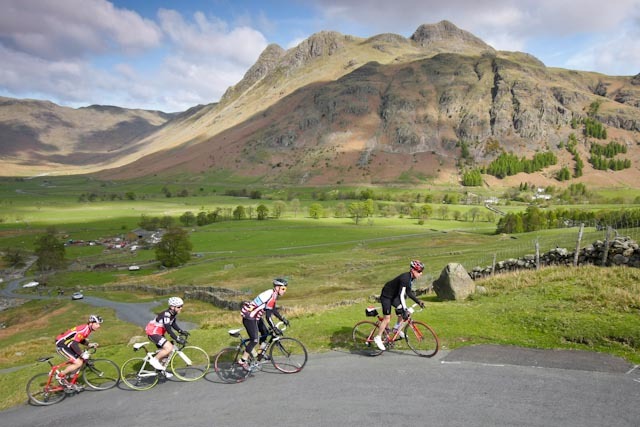 There is also the shorter, more leisurely ride of The Lakeland to allow cyclists to enjoy the majestic landscape of the Lake District without the extremes of the high mountains.